Harley-Davidson’s Anoop Prakash describes how the motorcycle company brought its legendary brand to India and made it relevant to consumers on the subcontinent. Harley-Davidson’s brand can be described with just one word: iconic. The very mention of the name conjures up images of James Dean or Steve McQueen living the American dream and powering off on their bikes down an open road towards exciting new horizons. In fact, the image of the Harley rider oozes the idea of power, authority and freedom; and the popular slogan “God rides a Harley”, while controversial, certainly positions the bike as a product of choice. Fans of the bike have popped up in unexpected places – Pope Francis famously sold his own Harley- Davidson for $327,000 earlier this year at a Bonhams auction in Paris. The price far exceeded the $16,000 to $22,000 pre-sale estimate. A leather Harley-Davidson motorcycle jacket signed by the pontiff also sold for $77,485 this year. The company culture is strong; it’s a case study in branding and it’s fair to say that few companies could boast as many fans that have their logo tattooed onto their very skin as Harley. In short, Harley-Davidson is very clear about what it is selling; and that’s not necessarily just bikes; it’s an image, an experience and a lifestyle. It is essentially selling its brand to people. But in 2009, the company faced a new and daunting challenge – to enter the Indian sub-continent; a country with an equally strong myriad of cultures, far from the “American dream’”– at least that described above – both geographically and metaphorically. This was a country where Harley faced a very real threat that its established iconic brand could actually work against it. 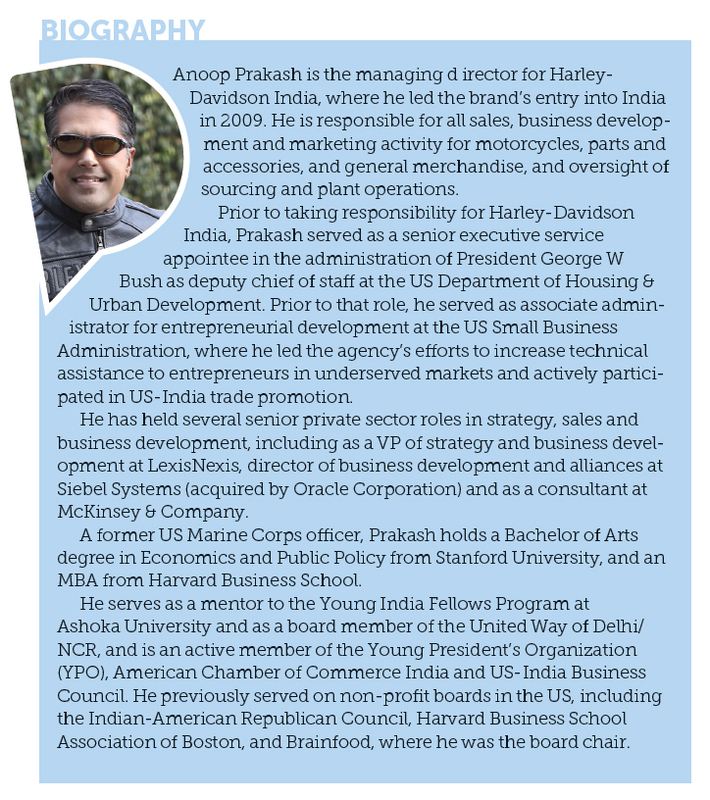 Anoop Prakash, who was selected to head the company’s expansion on the sub-continent as MD of Harley- Davidson India, explains: “In India in 2009, there was a high brand awareness of Harley-Davidson, but awareness does not always translate to relevance. There were broad misconceptions about Harley-Davidson customers, originating from the pop culture stereotypes of Arnold Schwarzenegger and Hells Angels on one hand, or older white men with beards, bellies and tattoos on the other. Prakash, was a man with a more than ambitious plan. But he had the varied experience to back up this ambition, having served as deputy chief of staff on former US President George W. Bush’s Department of Housing and Development, promoted trade and entrepreneurship at the US Small Business Administration and worked in corporate roles including VP of strategy and development at LexisNexis and business development at Siebel Systems. “I had a variety of experiences that together helped me navigate the challenges of this role – working in the public sector, building new businesses, retail strategy, and sales and business development. I also had broad Asia exposure, through consulting projects in India and as part of a US trade delegation to China,” he explains. But how much of a Harley fan was Prakash himself? “As a first generation Indian American, I always had an itch to go back to India for some time and connect with relatives, and live in the city in which my parents grew up. Purely by chance, I was speaking to a former classmate of mine from business school who was at Harley at the time, and he mentioned that Harley was working on a plan for India. He introduced me to the Asia-Pacific leadership, and the rest is history. I found I had many common connections with some of the key executives and of course shared the same Midwestern upbringing and values. It was a great fit in both directions.” And so, against the aforementioned challenging backdrop – and with an experienced and enthusiastic leader in place – Harley set itself the challenge, not merely to sell bikes on the sub-continent, but to build them on site. Harley-Davidson India is a wholly owned subsidiary of Harley-Davidson Inc and commenced operations in August 2009. “In India, we established a subsidiary from day one – allowing us to guide the business and brand with a long-term view in mind. There were two major challenges in driving the business forward in India,” explains Prakash. “The first challenge was to make the brand accessible given the import tariffs and taxes made the price point of a Harley motorcycle in India almost double the price in the US. “The second challenge was to meet the world class customer expectation – and generally speaking, Indian dealers were not known for delivering the high levels of customer service we wanted to achieve. Thankfully, with more and more premium brands entering the market, this trend is changing. And true to its word, Harley started putting motorcycles together at its assembly unit in Haryana in 2011. Prakash picks up the story. “The initial assembly operations started in 2011 when we started assembling three models from our Sportster family,” he says. “We added a further three models from the Dyna family in 2012, three more from the Softail family in 2013. And in 2014, we launched a new global platform called the Street 750, which will be built in the US and India. The India-built motorcycles will be exported to Europe and Asia. Each of these investments created greater accessibility, which helped spur our growth.” And moving to address the branding hurdle, he adds: “Harley-Davidson is an American company and Indians had a long-standing affinity for American brands, such as Levi’s and McDonald’s. “When we launched here, rather than spending too much energy on advertising, we felt it was a better investment to create events that could provide on-the-ground demonstrations of our lifestyle and culture. We wanted to help local people see the relevance of Harley-Davidson to their own lives. Although we were a ‘foreign brand’ when we opened our assembly plant, we were telling Indian customers: ‘We are here to stay and invest in the market – not just to import and sell’. Just taking a look through Harley-Davidson’s press cuttings for 2013 alone shows how hard Prakash and his team have worked to nurture a love of biking in India. It is full of pictures of groups of riders cruising along India’s roads, or testimonials from customers putting to bed the Schwarzenegger stereotype. “We had what we called ‘Founders’ Rides’ where we asked the earliest owners to come ride with us at our new dealership openings – it created excitement and gave the local community a sense of the lifestyle they could now access,” says Prakash. “We also launched a rock music property with Rolling Stone magazine called ‘Harley Rock Riders’, which were a series of ‘rock rallies’. We are providing a stage for independent Indian rock bands to showcase new music and we’re spreading these around India – bringing together our love of bikes and our commitment to the Indian rock music scene – a further demonstration of the global lifestyle in a locally relevant way. And in order to find out what is accessible to the Indian markets and other key markets, the company has had to do its homework and carry out expansive research into consumer behaviour. In fact, during the development of the new Street 750 & Street 500 models, the company carried out detailed focus group studies of 3,000 people globally, and 500 of the respondents were from India. Data suggests China is the largest two-wheeler market in the world, with India not far behind selling more than 13 million two-wheelers last year. Of these, 80% are motorcycles, as opposed to scooters (data sources: Society for Indian Automobile Manufacturers – www.siam.in). Prakash explains: “India has a rich motorcycling history and culture where people enjoy travelling and socializing together in groups. Economic development has led to middle class growth here and an increase in leisure time. We are talking to people about using this free time for self-expression and re-discovering their true passions. For many, that includes fond memories of riding an old Yamaha or Yezdi in college, for others they are riding for the first time. And does he believe the company has been successful in its Indian expansion? In fact, India is now has the third largest Harley-Davidson manufacturing operation on earth, after the US and Brazil. But in spite of this exponential growth and a bright future, Prakash is under no allusions that the story is finished – on the contrary, he believes there is much more work to do. “There is now a strong brand awareness and an appreciation of the lifestyle and product here,” he says. “But we are continuing to work on developing the strong brand awareness and this involves constant outreach. “I would say we’re starting to see the potential now. We will launch the Street 750 in India this year – a Harley-Davidson for the next global generation. This will bring the entry price within reach to many younger enthusiasts and provide a platform for new growth. As Dialogue’s interview with Harley’s “man in India” comes to a close, it is evident that his management style embodies the qualities that his company’s product also boasts – speed, agility, strength, determination and resilience. But in the same way that new technologies improve and enhance the bikes, Prakash wants to evolve and enhance both his own leadership style and the performance of the company. “This job is measured beyond spreadsheets and sales reports,” he says. “It’s about listening to customers. The best part of my job is when people say to me: ‘Thank you for bringing Harley-Davidson to this country and changing my life.’ On the flip side, the worst day is when a customer will tell me we haven’t lived up to their expectation– this is what drives us every day. In this vein of flexibility and agility, Prakash’s leadership style is not just about grit and determination in facing the mammoth task of “breaking” a new market with an established product, but also about challenging the leaders in his own company and telling them when a strategy won’t work in his region. “Harley-Davidson is 110 years old and we do many things very well – but it’s important to challenge the status quo and orthodoxy when you know a market operates in a different manner than what has worked elsewhere. There is also a need to segment emerging and developing markets from mature markets at times to ensure the right approach is being taken and for the right reasons,” he explains. But on the other hand, Prakash puts a lot of belief in the company’s established culture in planning the growth of his own branch of the business. In fact, current Harley-Davidson India could be described as similar to that iconic referred to at the opening of this interview: a strong product riding out into the unknown – albeit with a clearly defined roadmap – and it’s Prakash and his team who are powering this machine forward down the Indian open road. This journey has just begun and it is one that leaders and managers around the world will be following with interest.